Get Out! When you hear gunshots, don’t second guess the situation. Get out immediately if at all possible. If you are out in the open, take cover or run away in a zig zag pattern. Hide Out! Find a location, lock or blockade the door, turn off the lights, spread out with others in the room and make a plan. Help Out! Help the injured as best you can until help arrives. Remain calm and quiet and be a calming influence for others. Fight! 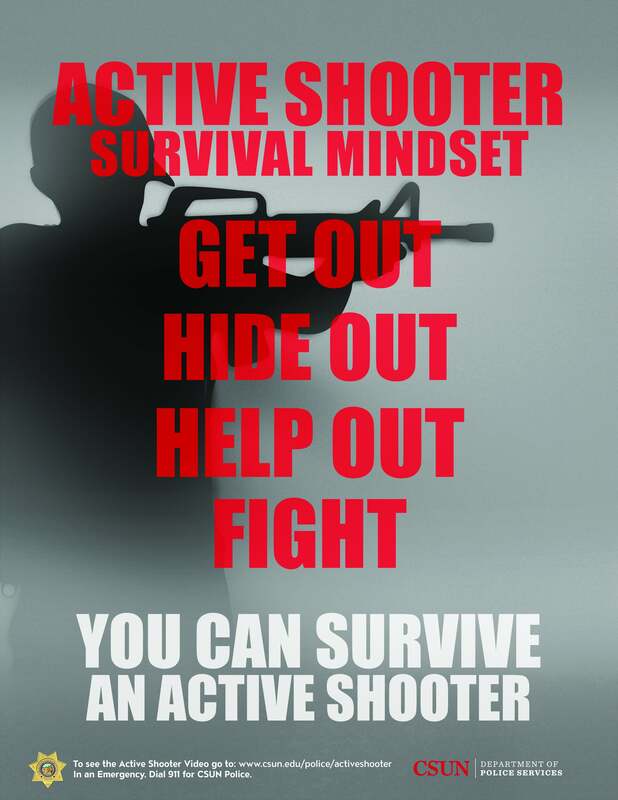 If neither running nor hiding is a safe option, as a last resort, when confronted by the shooter, consider trying to disrupt or incapacitate the shooter. This can be done by using aggressive force such as using items in the environment to throw at a shooter (fire extinguisher, chair, backpacks, etc.). This is a life/death situation in which your “survival mindset” must take over! Additionally, the Department of Police Services will utilize redundant methods of communication to send emergency messages and updates via email, voicemail, text, social media posts and emergency signage. It is very important that you update your contact information in the myNorthridge portal or the CSUN mobile app so the University may contact you in the event of an emergency. As text messaging can be prone to delay, you are encouraged to also provide an alternate telephone number and your email address. From the home page of the myNorthridge portal, click on the "SOLAR STUDENT CENTER" Quick Link on the right-hand side of the page. Scroll down to "Personal Information" to review and update your contact information, especially telephone and email listings. The California State University, Northridge Department of Police Services considers the training and preparedness of it's officers as one of the most important responsibilities. Officers are trained to respond to a myriad of situations-- natural disasters (earthquakes), hazardous materials (chemical spills) and active shooter situations, to name a few. 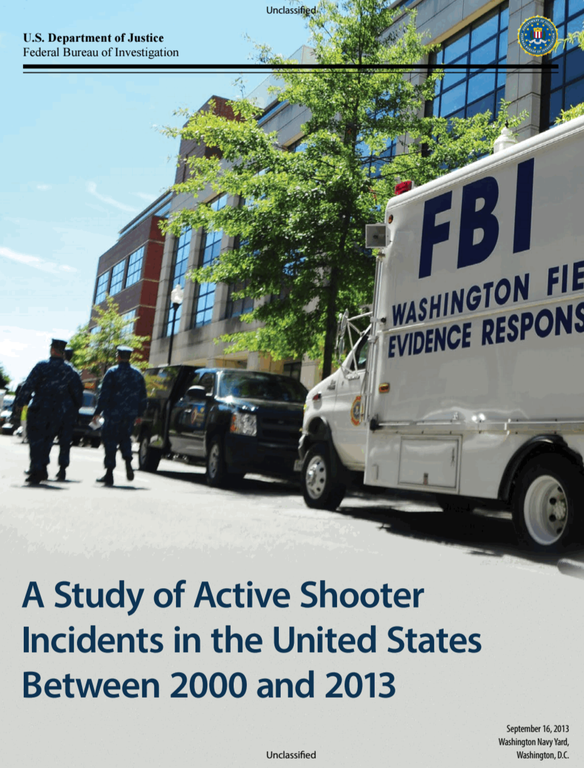 In May, 2016, the Department of Police Service hosted its nineth Multi-Agency Active Shooter Exercise with it's allied law enforcement agencies. This annual training hosts over 60 officers from such agencies as the California Highway Patrol, Los Angeles Police Department, Los Angeles County Sheriff's Department, and Los Angeles School Police. To request posters and/or bookmarks, please contact the Office of the Chief of Police (818) 677-7922 or email Christina Villalobos. 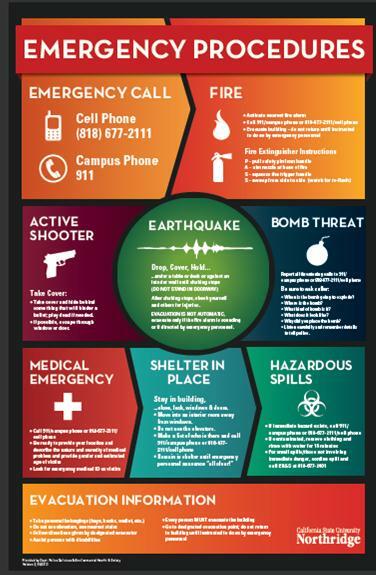 Emergency Procedures posters are available. Contact Christina Villalobos at x7922 or by email. Faculty or Staff wanting assistance in talking about an Active Shooter incident on campus, please contact the Office of the Chief of Police through Christina Villalobos at x7922 or via email. 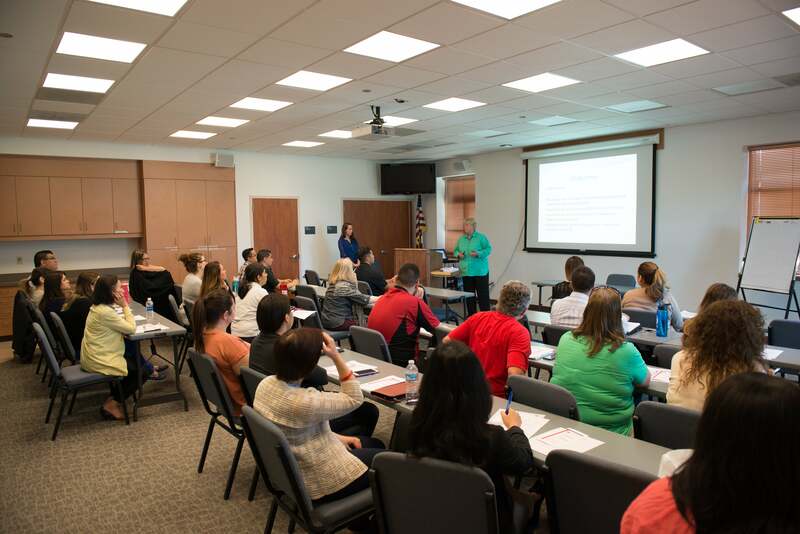 for faculty, staff, and students discuss a variety of emergency situations and procedures (including active shooter). These are available in hard copy and explained online. Click the image for more detail.